Men and women have both played an important role in the preparation and production of rope at The Historic Dockyard, Chatham. With the introduction of new mechanised machines for hatchellers and spinners a cheaper workforce was required. Female workers were employed for their cheapness and soon became known as the ‘women’ of the Ropery. Widows and single daughters of The Historic Dockyard workers were first employed to assist in the preparation of fibres to be spun into yarn. Ordinary working women were later accepted to work at The Ropery and did various jobs that were vital to the efficiency of ropemaking. The working day for all employees started at 7:30am and ended at 4:00pm, however it was altered by half an hour from the rest of The Historic Dockyard to ensure different workers did not mix on their way to work. Women were kept separate from male workers and entered The Ropery through the Hatchelling House. Opposite No 1 Hemp House and next to the Double Ropehouse the ‘Women’s Entrance’ still exists. 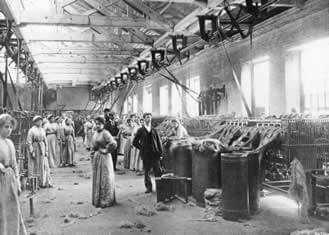 The number of male Ropemakers fell in the 1860’s from 150 to 30 men with the introduction of machines and the intake of female workers. 1864 marked the introduction of the spinning machine to the upper floor of The Ropery and women workers were employed to look after the new machines. In 1808 The Ropery employed 27 apprentices to undertake spinning, tarring and dividing yard and finally laying. Naval, Dockyard and ropemaker apprentices all performed important jobs for the Ropemaker. Today Fred Cordier, the Master Ropemaker, and three Ropemakers are responsible for the production of rope. As an enthusiastic and dedicated ropemaker Fred has worked at The Ropery since 1962. His knowledge and expertise ensures that ropemaking continues at The Historic Dockyard Chatham for all to enjoy. Some images Courtesy of National Maritime Museum Picture Library.